Trace fossils, which preserve records of the behaviour of organisms, provide an independent record of life over Earth history. Trace fossils include the impressions made by organisms on the sediment as they moved, grazed and burrowed on the seafloor. Importantly, they often reveal the presence of organisms within an ecosystem even in the absence of their actual body fossils. Traces can also tell us something about the biological and behavioural complexity of the organisms, and of their physical impact on their surrounding environment. The Ediacaran trace fossil record has undergone significant expansion in recent years, and has been reviewed in several publications (e.g. Jensen et al. 2006; Carbone & Narbonne 2014; Liu & McIlroy 2015; Buatois & Mangano 2016). Rapid developments in ichnological studies have enabled researchers to not only identify the broad patterns in behavioural evolution across the Ediacaran-Cambrian transition, but also explore the causes and consequences of increasing behavioural complexity in marine ecosystems (Mangano & Buatois 2014). There are numerous claims for the oldest evidence for movement in the geological record. Many of the oldest, stretching back over 1 billion years (e.g. Seilacher et al. 1998; Rasmussen et al. 2002), are likely to either be abiological or microbial structures (e.g. Mariotti et al. 2016), or trackways created by simple unicellular organisms such as gromiid foraminifera (Matz et al. 2008). The earliest strong candidates for traces made by animals come from the ~565 million year old sediments of the Mistaken Point Formation, Newfoundland. Around 90 separate impressions are found on a single bedding surface, each one preserved as a shallow groove within the surface, up to 13mm in width and several centimetres in length (Liu et al. 2010; Liu et al. 2014). Although many have a smooth interior, some of them possess hemispherical ridges of sediment within the groove, and a circular pit at one end. They are therefore considered to record the horizontal movement of an organism with a circular base along the seafloor. Similarities have been recognized between these traces and those made by modern sea anemones, which move across sediment by hydrostatic inflation of their bases. It has been suggested that the hemispherical ridges could only be produced by an organism with muscular tissue (Liu et al. 2010). If this is correct, the Mistaken Point traces may record some of the oldest fossil evidence for mobile animals. Claims for trace fossils in older rocks from Uruguay, around 585 million years ago (Pecoits et al. 2012), are not widely considered to record true Ediacaran traces, since the age of the rocks they occur in has been suggested to be considerably younger than the Ediacaran (Carboniferous-Permian; Gaucher et al. 2013). Horizontal surface traces from the Mistaken Point Formation, ~565 Ma, Newfoundland. Trace fossils remain rare throughout the Newfoundland successions (though see Menon et al. 2013 and Liu & McIlroy 2015), but elsewhere in the world, around 555 million years ago there is a sudden explosion in the volume and diversity of traces. One of the most common trace fossils from this time interval is a form called Helminthoidichnites, seen widely in South Australia. These again record horizontal surface movement (i.e. by organisms that did not burrow down into the sediment), and they form bilobed traces that weave their way across bedding planes. They were likely to have been produced just beneath the surface of microbial mats that covered the surfaces, giving their producers the name 'under-mat miners'. Helminthoidichnites traces from the Ediacara Member, South Australia Museum. Perhaps the most continuous record of the evolution of trace fossil complexity comes from NW Canada. There, the gradual transition from simple Helminthoidichnites traces to more complex forms, and then to true vertical burrowing, is laid out in rocks of the Blueflower Formation (Carbone & Narbonne 2014). The first notable change is the development of avoidance behaviour within the simple surface traces - they appear to avoid crossing or touching, suggesting that the organisms making them could sense areas that had been disturbed, or already grazed. Traces then begin to explore the seafloor in a systematic manner, revealing a new level of neural complexity to search for food and avoid areas that had already been searched. Such traces become increasingly abundant, and along with evidence for bilobed burrows (very shallow burrows in the sediment) in China (Chen et al. 2014), they suggest numerous mobile animals were present in the oceans from ~555 million years ago. An Epibaion trace fossil from South Australia, interpreted to record the resting (and possibly feeding) position of a Dickinsonia specimen. 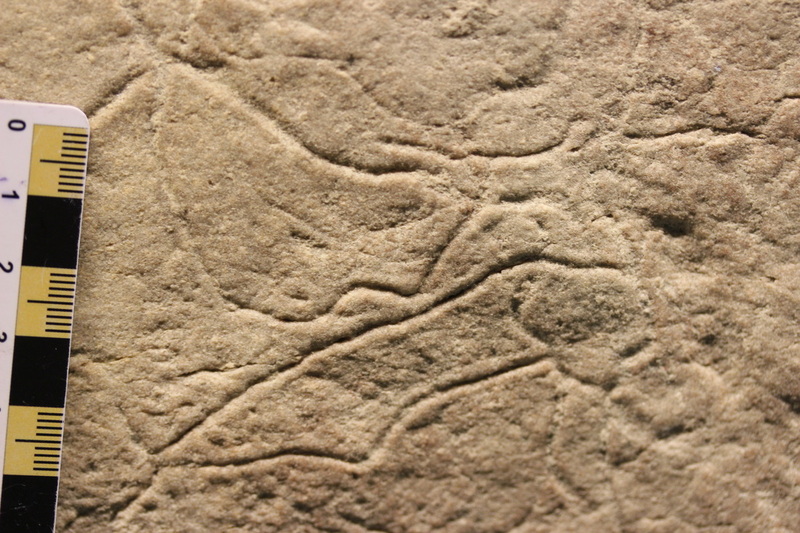 A Kimberella specimen associated with fan-like scratch marks, interpreted as feeding traces. South Australia Museum. Movement amongst the Ediacaran macrobiota? There is evidence, particularly from South Australia and the White Sea, that a small number of the Ediacaran macro-organisms were capable of movement. Dickinsonia and Yorgia have both been found preserved alongside 'ghost' impressions of their bodies, interpreted to record previous positions of the organism as it moved across the seafloor and fed (Sperling & Vinther 2010; Ivantsov 2011). Meanwhile, Kimberella has been found at the end of long grooves, and next to fan-like arrays of scratch marks, that have been suggested to record evidence for movement and grazing (Ivantsov 2009; Gehling et al. 2014). At present, these are the only Ediacaran macro-organisms to have been found in direct association with traces, but they suggest that at least some of the Ediacaran biota were mobile, and probably animals. Cross section through a bed from the Khatyspyt Fm. of Siberia, showing structures interpreted as burrows and backfilled meniscae, ~553 Ma (Rogov et al., 2012). Vertical burrowing and sediment mixing in the Ediacaran? 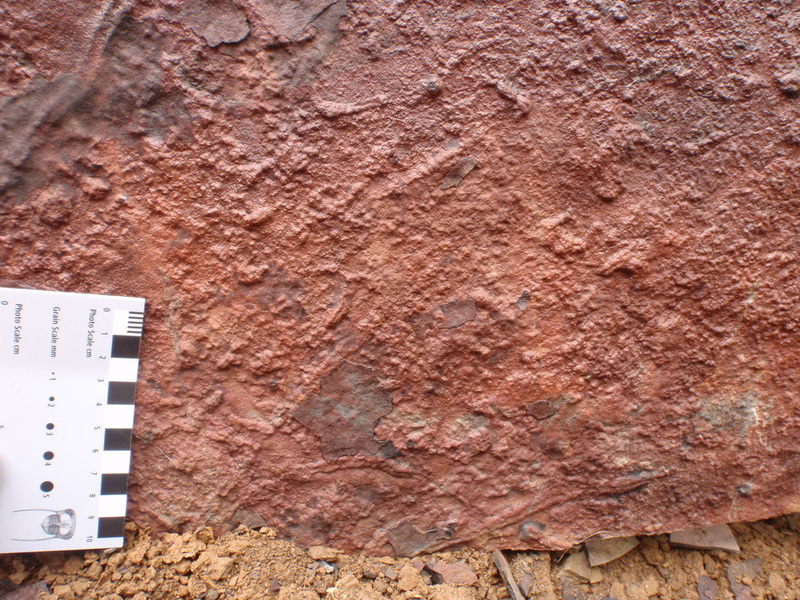 For many years, it was thought that horizontal trails on the sediment surface, or just beneath the microbial mats that lay on the surface, were the only trace fossils found in Ediacaran rocks (e.g. Jensen et al. 2006). Vertical burrowing into the sediment was considered to be a Cambrian phenomenon. In 2012, material was described from the Khatyspyt Formation of Siberia that was interpreted to document abundant bioturbation (burrowing and mixing of sediment) within shallow-marine carbonate sediments of around 553 million years in age (Rogov et al. 2012). The Khatyspyt material consists of chains of silicic cresent-shaped structures within a dolomitic sedimentary matrix, and similar material has now been observed in the Ukraine (Rogov et al. 2013) and China (Dong et al. 2008). This ichnological interpretation has been questioned (e.g. Brasier et al. 2013), but if correct, would imply that organisms capable of vertically mixing the sediment were present in certain environments during the latest Ediacaran Period. Claims have also been made for U-shaped burrows in Namibia (Macdonald et al. 2014) in the latest Ediacaran, suggesting additional behavioural innovation amongst mobile organisms at this time. 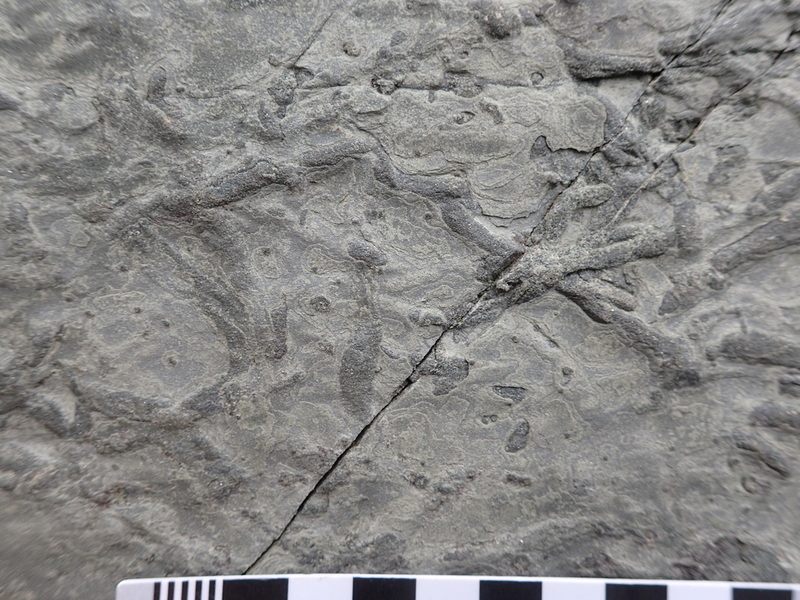 The trace fossil Treptichnus pedum, from the Lower Cambrian Chapel Island Formation, Grand Bank, Newfoundland. The boundary between the Ediacaran and Cambrian Systems is defined by the first appearance of a particular trace fossil assemblage, exemplified by the complex branching burrow Treptichnus pedum (Brasier et al. 1994). Within just a few tens of metres of strata, evidence for further animal activity becomes abundant, with arthropod scratch-marks (e.g. Monomorphichnus and Cruziana), and corkscrew-like burrows (Gyrolithes) amongst the trace fossils found in lowermost Cambrian rocks (e.g. Narbonne et al. 1987). This spectacular increase in trace fossil abundance and diversity heralds the start of what has been termed the 'Cambrian Explosion', which continues with the first appearance of small shelly fossils, and eventually culminates with at least two thirds of the modern animal phyla being present by the end of the Cambrian Period (Conway Morris, 2000; Briggs, 2015). However, our ever-expanding knowledge of the Ediacaran precursors to the Cambrian animal fossil and trace fossil records suggest this evolutionary explosion has much deeper roots.